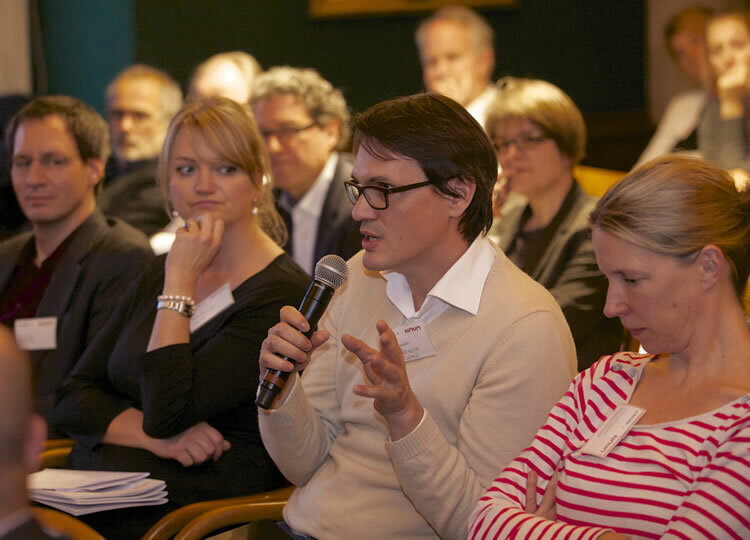 This week’s annual Berinfor workshop on educational management, with the topical focus on reputation marketing, was a reminder of the long way higher ed marketing in the German speaking part of Europe has come – and how far it apparently still has to go. Berinfor has been consulting for twenty years in the Swiss university sector, with a firm base in what amounts (in my humble opinion) to a sensible adaptation of the St Gallen Management Modell to higher education. All the more surprising then, was the rather subdued (read: conservative) tone of the event – although I should probably have adjusted my expectations seeing that the title of the event referred not to the (corporate, marketing) term “reputation”, but the much more subtle “renomée” of an institution as a performance indicator and success factor with a “real dividend”. 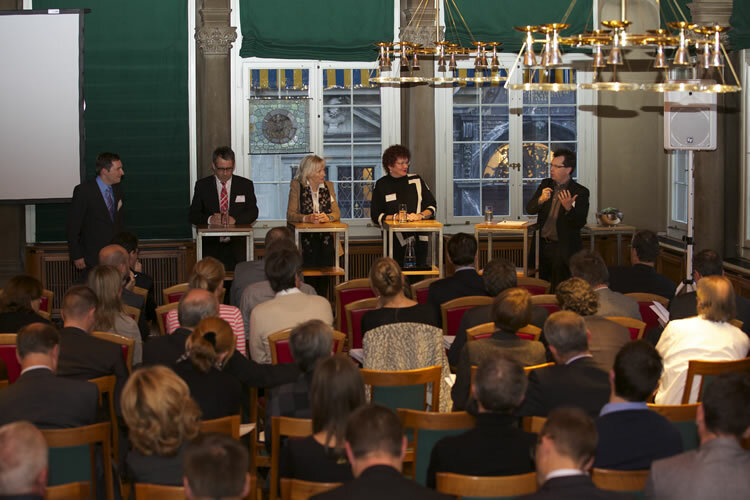 I am grateful for the kind invitation to a delightful networking occasion in Zurich’s Saffran Guild House, but with four top-notch speakers from renowned Swiss institutions the focus of the afternoon was not – as one might hope – how to manage and perhaps increase said renomée (as several of the speakers pointed out, the French term used to carry connotations of bragging or boasting in a German in mid-20th century still), but an analysis of its possible sources and the argument that it does in fact amount to intangible capital worth preserving. 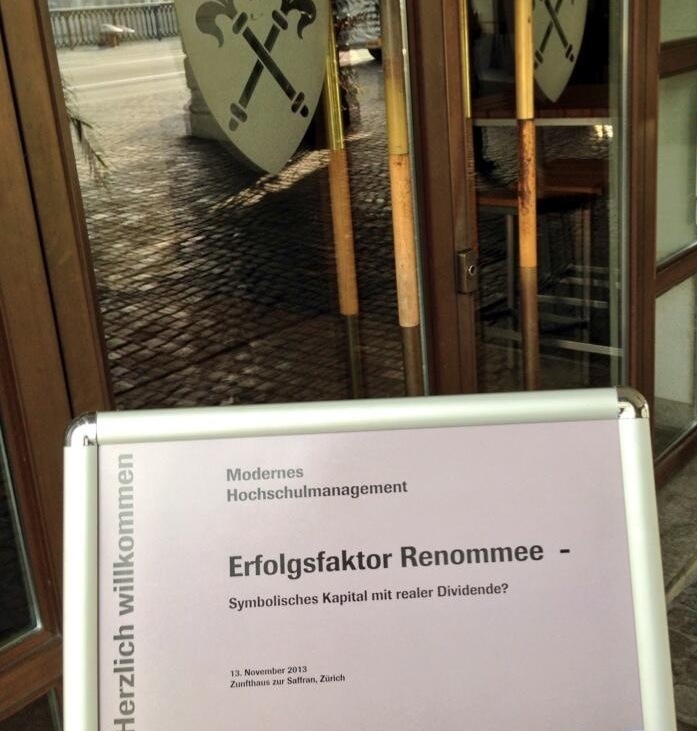 Of course, faculty and management of ETH Zurich (ETHZ) and University of St Gallen (HSG) are rather shining examples of acquiring and maintaining a stellar reputation, but in a time of a rapidly changing global education landscape, largely driven by technology, the notion of a monolithic, centrally managed brand strategy based on research output (ETHZ) and selective recruiting of both students and faculty (HSG) seems of limited help to the many representatives of smaller Swiss institutions who were attending. A few Swiss universities enjoy stellar reputation in Europe and around the world. Can the others benefit from their strategies? It appears that in Switzerland, where higher education is still financed overwhelmingly from the public purse, the notion of marketing the degree programs or research capabilities for a given university or college is often counterintuitive still, especially to those faculty and leadership who value precisely the egalitarian, merit-based features of public education. I well remember that in neighbouring Germany, where universities as little (in terms of institutional history) as twenty years ago had only acquired a media relations office and at best an in-house graphic designer for the design of brochures and flyers, marketing was thought to be part of a neo-liberal agenda of privatizing and “marketizing” the educational system in light of deregulation and financial deficits. While I don’t mean to harp on about federalist fragmentation hampering educational reforms, but it was two initiatives on the German national stage that gradually institutionalized change there: In 1995, the German Rector’s Conference (GRC) published a policy paper on university public relations, with concrete recommendations framed in the context of increased institutional autonomy, yet studiously avoiding the loaded term marketing. Eight years later in 2003, it is permissible to speak of “international marketing” in a GRC policy paper regarding the European harmonization of degree programs, presumably because the competitive dimension is among neighbouring systems of education, not individual institutions. This gives license to a handful of big players with resources to spare and internal or acquired communications know-how, to actively manage their perceived reputation on the national and international stage. Some of the medium-sized or small institutions undertake courageous efforts for domestic marketing, especially the East German universities suffering from a regional-only focus, but often elicit the wrong (private sector) support, and have to bear the brunt of political criticism and thus marketing is considered mainly for communications abroad. Marketing Swiss higher education is not exactly pushing deck chairs around the Titanic. More like giving away tickets for staterooms on the QE II. Will it last? To address the practical level, the German Academic Exchange Service (GAES) is catalyst for the creation of GATE Germany as a national consortium of meanwhile 140 institutions in 2001, to help market German higher education abroad. GATE is a service provider and best-practice respository, that both advertises the German educational system as a whole and is available for individual services to member institutions, i.e. providing support, infrastructure and know-how for a German university interested in mounting a campaign in a particular foreign market or region, but lacks the wherewithal to open its own permanent office there. The program had its fits and starts, but can be considered a success some ten years after its inception. Let us hope that the learning curve is a bit steeper this time around: The CGR is currently preparing a position paper on MOOC and emergent forms of higher education based on new media, to be presented in May 2014. It is to be hoped that a “consortium” for MOOC and similar forms of distance learning – sensibly involving FernUniversität Hagen along with the GAEC/GATE Germany – will follow afoot. Switzerland’s much stronger degree of federalization, made more fragmented still by the linguistic regions in the country, will probably continue without any such national network, as it continues to recruit more than enough foreign students and faculty. Though demographic trends of ageing and shrinking birth rates will make their impact felt here, too, it appears a more pressing concern for the public relations of Swiss universities seems the domestic pressure from the right to maintain sufficient “Swissness” in higher education, which has already tarnished reputation abroad. I look forward to Berinfor’s 2014 workshop a whole long year (in terms of educational upheaval) from now, hoping perhaps for a more operational focus.